This diachronic study of Boudica serves as a sourcebook of references to Boudica in the early modern period and gives an overview of the ways in which her story was processed and exploited by the different players of the times who wanted to give credence and support to their own belief systems. 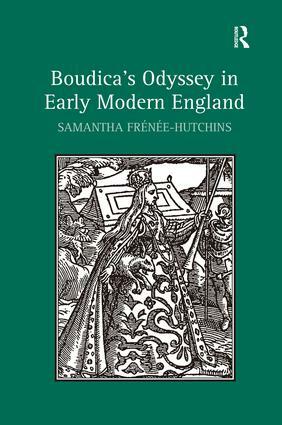 The author examines the different apparatus of state ideology which processed the social, religious and political representations of Boudica for public absorption and helped form the popular myth we have of Boudica today. By exploring images of the Briton warrior queen across two reigns which witnessed an act of political union and a move from English female rule (under Elizabeth I) to British/Scottish masculine rule (under James VI & I) the author conducts a critical cartography of the ways in which gender, colonialism and nationalism crystallised around this crucial historical figure. Concentrating on the original transmission and reception of the ancient texts the author analyses the historical works of Hector Boece, Raphael Holinshed and William Camden as well as the canonical literary figures of Edmund Spenser, William Shakespeare and John Fletcher. She also looks at aspects of other primary sources not covered in previous scholarship, such as Humphrey Llwyd’s Breuiary of Britayne (1573), Petruccio Ubaldini’s Le Vite delle donne illustri, del regno d’Inghilterra, e del regno di Scotia (1588) and Edmund Bolton’s Nero Caesar (1624). Furthermore, she incorporates archaeological research relating to Boudica. Samantha Frénée-Hutchins is a Senior Lecturer in the Department of English at Orléans University, France.